When it comes to fluid transfer on the farm and in the field, Agriflex is the layflat agricultural hose solution. Agriflex is a large diameter, lightweight, flexible and compact pumping/dewatering hose alternative. Engineered for longer service life, this extruded through-the-weave PVC/nitrile rubber hose combines a thin rib construction with a high tenacity woven jacket for the ultimate in puncture, abrasion and durability. Agriflex affords exceptional working pressure — due in part to its unique synthetic textile core. 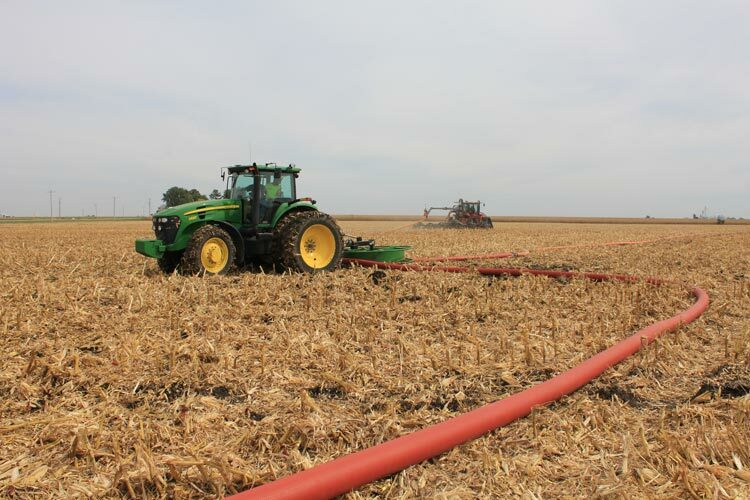 Offered in a variety of diameters from 6" to 10" in lengths up to 660', Agriflex is a tried and true solution to supply liquid manure to injection hose applications. Agriflex is made from 100% high tenacity synthetic polyester yarn, circularly woven and completely protected by a through-the-weave extruded PVC/Nitrile cover and lining. Engineered to perform in any environment, Agriflex can withstand surface temperatures from 1200 ºF to -35 ºF. Agriflex is guaranteed to withstand 10,000 cycles on the Taber Abrasion Machine (H‑22 Wheel: 0.5 kg), without exposing the liner. Exposure to sea water and contamination by most chemical substances, hydrocarbons, oils, alkalis, acids and greases have no effect on the performance of Agriflex hose. Agriflex coupling options as required and specified by purchaser. Nato Green available in 6", 8" and 10". Red available in 7" and 8" HD. Agriflex shall carry a 2-year written warranty against defects in materials and workmanship.